Specially formulated for successful fall seeding. Use on established lawns or to start new lawns. Repairs summer damage and provides an attractive, thicker, greener lawn. Use in sun and shade lawn areas. Contains naturally insect resistant grass. This premium all-purpose mix is specially designed for use in sunny to moderately shady areas of the Northeast. Contains improved drought tolerant seed varieties with good disease and insect resistance. A truly innovative darker-green turfgrass planted by sod growers. Has improved disease resistance and drought tolerance. Grows well in clay or sandy soils and in full sun or partial shade. Contains naturally insect resistant grass. Preserves moisture in the leaf and wards off stress from heat, cold, wind and disease. Roots 4-feet deep into the soil. Provides quick grass coverage for both sunny and shady areas. Provides quick, dense coverage. Formulated and mixed specifically for the region of the country where it is sold. For use in sunny to partly shaded areas. 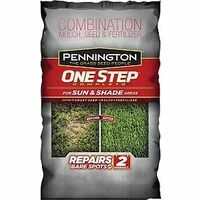 Contains Pennington's exclusive Penkoted technology to ensure better plant growth. Quick germination and cover makes this seed ideal for stabilization or temporary seeding. An excellent value. Professional grass seed mixture. Provides a quick dense coverage. Formulated and mixed specifically for your region of the country. For use in sunny to partly shaded areas.